Just before Easter (and, perhaps more significantly, just before April Fool’s Day) a paper by van Dokkum et al. 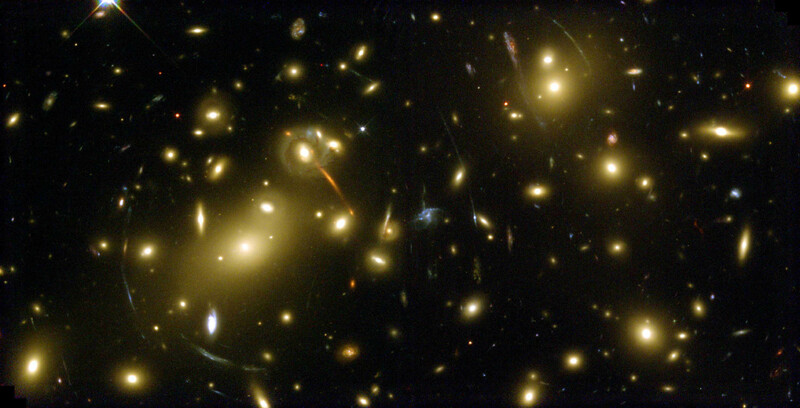 was published in Nature with the title A Galaxy Lacking Dark Matter. As is often the case with scientific publications presented in Nature, the press machine kicked into action and stories about this mysterious galaxy appeared in print and online all round the world. Studies of galaxy surveys in the context of the cold dark matter paradigm have shown that the mass of the dark matter halo and the total stellar mass are coupled through a function that varies smoothly with mass. Their average ratio Mhalo/Mstars has a minimum of about 30 for galaxies with stellar masses near that of the Milky Way (approximately 5 × 1010 solar masses) and increases both towards lower masses and towards higher masses. The scatter in this relation is not well known; it is generally thought to be less than a factor of two for massive galaxies but much larger for dwarf galaxies. Here we report the radial velocities of ten luminous globular-cluster-like objects in the ultra-diffuse galaxy NGC1052–DF2, which has a stellar mass of approximately 2 × 108 solar masses. We infer that its velocity dispersion is less than 10.5 kilometres per second with 90 per cent confidence, and we determine from this that its total mass within a radius of 7.6 kiloparsecs is less than 3.4 × 108 solar masses. This implies that the ratio Mhalo/Mstars is of order unity (and consistent with zero), a factor of at least 400 lower than expected. NGC1052–DF2 demonstrates that dark matter is not always coupled with baryonic matter on galactic scales. I didn’t have time to read the paper thoroughly before the Easter weekend, but did draft a sceptical blog on the paper only to decide not to publish it as I thought it might be too inflammatory even by my standards! Suffice to say that I was unconvinced. Anyway, it turns out I was far from the only astrophysicist to have doubts about this result; you can find a nice summary of the discussion on social media here and here. Fortunately, people more expert than me have found the time to look in more detail at the Dokkum et al. claim. There’s now a paper on the arXiv by Martin et al. It was recently proposed that the globular cluster system of the very low surface-brightness galaxy NGC1052-DF2 is dynamically very cold, leading to the conclusion that this dwarf galaxy has little or no dark matter. Here, we show that a robust statistical measure of the velocity dispersion of the tracer globular clusters implies a mundane velocity dispersion and a poorly constrained mass-to-light ratio. Models that include the possibility that some of the tracers are field contaminants do not yield a more constraining inference. We derive only a weak constraint on the mass-to-light ratio of the system within the half-light radius or within the radius of the furthest tracer (M/L_V<8.1 at the 90-percent confidence level). 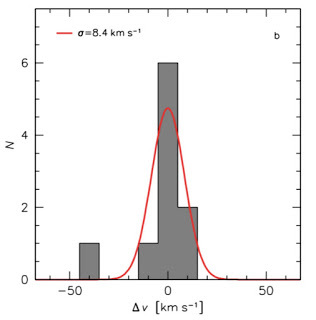 Typical mass-to-light ratios measured for dwarf galaxies of the same stellar mass as NGC1052-DF2 are well within this limit. With this study, we emphasize the need to properly account for measurement uncertainties and to stay as close as possible to the data when determining dynamical masses from very small data sets of tracers. More information about this system has been posted by Pieter van Dokkum on his website here. Whatever turns out in the final analysis of NGC1052-DF2 it is undoubtedly an interesting system. It may indeed turn out to have less dark matter than expected though I don’t think the evidence available right now warrants such an inference with such confidence. What worries me most however, is the way this result was presented in the media, with virtually no regard for the manifest statistical uncertainty inherent in the analysis. This kind of hype can be extremely damaging to science in general, and to explain why I’ll go off on a rant that I’ve indulged in a few times before on this blog. The past few years have seen a slew of announcements of major discoveries in particle astrophysics and cosmology. The list includes faster-than-light neutrinos; dark-matter particles producing γ-rays; X-rays scattering off nuclei underground; and even evidence in the cosmic microwave background for gravitational waves caused by the rapid inflation of the early Universe. Most of these turned out to be false alarms; and in my view, that is the probable fate of the rest. The piece went on to berate physicists for being too trigger-happy in claiming discoveries, the BICEP2 fiasco being a prime example. I agree that this is a problem, but it goes far beyond physics. In fact its endemic throughout science. A major cause of it is abuse of statistical reasoning. Anyway, I thought I’d take the opportunity to re-iterate why I statistics and statistical reasoning are so important to science. In fact, I think they lie at the very core of the scientific method, although I am still surprised how few practising scientists are comfortable with even basic statistical language. A more important problem is the popular impression that science is about facts and absolute truths. It isn’t. It’s a <em>process</em>. In order to advance it has to question itself. Getting this message wrong – whether by error or on purpose -is immensely dangerous. Statistical reasoning also applies to many facets of everyday life, including business, commerce, transport, the media, and politics. Probability even plays a role in personal relationships, though mostly at a subconscious level. It is a feature of everyday life that science and technology are deeply embedded in every aspect of what we do each day. Science has given us greater levels of comfort, better health care, and a plethora of labour-saving devices. It has also given us unprecedented ability to destroy the environment and each other, whether through accident or design. Civilized societies face rigorous challenges in this century. We must confront the threat of climate change and forthcoming energy crises. We must find better ways of resolving conflicts peacefully lest nuclear or chemical or even conventional weapons lead us to global catastrophe. We must stop large-scale pollution or systematic destruction of the biosphere that nurtures us. And we must do all of these things without abandoning the many positive things that science has brought us. Abandoning science and rationality by retreating into religious or political fundamentalism would be a catastrophe for humanity. Unfortunately, recent decades have seen a wholesale breakdown of trust between scientists and the public at large. This is due partly to the deliberate abuse of science for immoral purposes, and partly to the sheer carelessness with which various agencies have exploited scientific discoveries without proper evaluation of the risks involved. The abuse of statistical arguments have undoubtedly contributed to the suspicion with which many individuals view science. 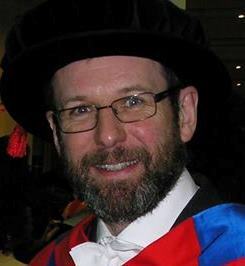 Some scientists offer the oversimplified version at the outset, of course, and these are the ones that contribute to the image of scientists as priests. Such individuals often believe in their theories in exactly the same way that some people believe religiously. Not with the conditional and possibly temporary belief that characterizes the scientific method, but with the unquestioning fervour of an unthinking zealot. This approach may pay off for the individual in the short term, in popular esteem and media recognition – but when it goes wrong it is science as a whole that suffers. When a result that has been proclaimed certain is later shown to be false, the result is widespread disillusionment. The worst example of this tendency that I can think of is the constant use of the phrase “Mind of God” by theoretical physicists to describe fundamental theories. This is not only meaningless but also damaging. As scientists we should know better than to use it. Our theories do not represent absolute truths: they are just the best we can do with the available data and the limited powers of the human mind. We believe in our theories, but only to the extent that we need to accept working hypotheses in order to make progress. Our approach is pragmatic rather than idealistic. We should be humble and avoid making extravagant claims that can’t be justified either theoretically or experimentally. The second thing that must be done is to improve the dire state of science education in schools. Over the last two decades the national curriculum for British schools has been dumbed down to the point of absurdity. Pupils that leave school at 18 having taken “Advanced Level” physics do so with no useful knowledge of physics at all, even if they have obtained the highest grade. I do not at all blame the students for this; they can only do what they are asked to do. It’s all the fault of the educationalists, who have done the best they can for a long time to convince our young people that science is too hard for them. Science can be difficult, of course, and not everyone will be able to make a career out of it. But that doesn’t mean that it should not be taught properly to those that can take it in. If some students find it is not for them, then so be it. We don’t everyone to be a scientist, but we do need many more people to understand how science really works. I realise I must sound very gloomy about this, but I do think there are good prospects that the gap between science and society may gradually be healed. The fact that the public distrust scientists leads many of them to question us, which is a very good thing. They should question us and we should be prepared to answer them. If they ask us why, we should be prepared to give reasons. If enough scientists engage in this process then what will emerge is and understanding of the enduring value of science. I don’t just mean through the DVD players and computer games science has given us, but through its cultural impact. It is part of human nature to question our place in the Universe, so science is part of what we are. It gives us purpose. But it also shows us a way of living our lives. Except for a few individuals, the scientific community is tolerant, open, internationally-minded, and imbued with a philosophy of cooperation. It values reason and looks to the future rather than the past. Like anyone else, scientists will always make mistakes, but we can always learn from them. The logic of science may not be infallible, but it’s probably the best logic there is in a world so filled with uncertainty. Crunch time for Dark Matter? It’s been agreed for decades that the universe must contain large amounts of so-called dark matter – about five times as much as all the matter visible as stars, galaxies and dust. This dark matter appears to exert a gravitational tug while not interacting significantly with ordinary matter or light in other ways. But no one has any idea what it consists of. Experiments have been trying to detect it for years, but all have drawn a blank. The situation is becoming grave enough for some researchers to start taking more seriously suggestions that what looks like dark matter is in fact a consequence of something else – such as a new force that modifies the apparent effects of gravity. This year could prove to be crunch time for dark matter: how long do we persist in believing in something when there’s no direct evidence for it? Anyway, I thought it would be fun to do a totally unscientific poll of the sort that scientists find fun to do, so here’s one. It’s actually quite hard to make this the topic of a simple question, because we know that there is ordinary (baryonic) matter that we can’t see, and there is known to be some non-baryonic dark matter in the form of a cosmic neutrino background. What the question below should be interpreted to mean, therefore, is `is there a dominant component of non-baryonic dark matter in the Universe in the form of some as-yet undiscovered particle?’ or something like that. For the record, I do think there is dark matter but less convinced that it is simple cold dark matter. On the other hand, I regard its existence as a working hypothesis rather than an article of faith and do not lose any sleep about the possibility of that hypothesis turning out to be wrong! 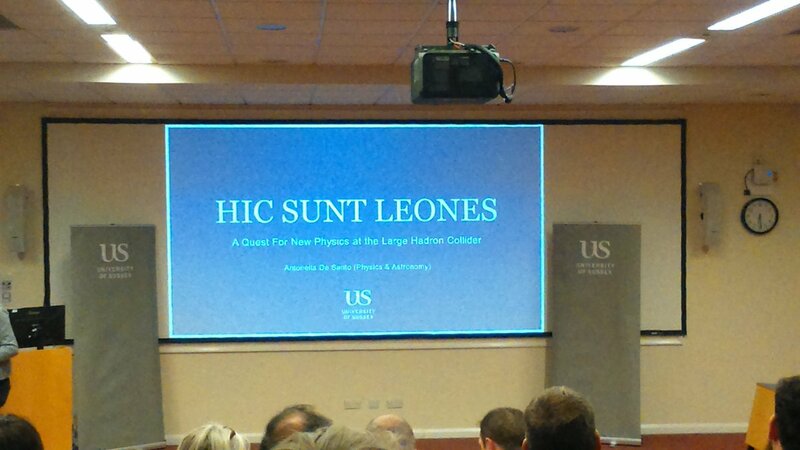 Just time for a very quick post, as today I travelled to Brighton to attend an inaugural lecture by Professor Antonella De Santo at the University of Sussex. Antonella was the first female Professor of Physics at the University of Sussex and I’m glad to say she was promoted to a Chair during my watch as Head of the School of Mathematical and Physical Sciences, at Sussex. That was about four years ago, so it has taken a while to arrange her inaugural lecture, but it was worth the wait to be able to celebrate Antonella’s many achievements. The lecture was about the search for physics beyond the standard model using the ATLAS experiment at the Large Hadron Collider, with a focus on supersymmetry and possibly candidates for dark matter. It was a very nice lecture that told a complex story through pictures and avoiding any difficult mathematics, followed by a drinks reception during which I got to have a gossip with some former colleagues. The title, by the way, stems from the practice among mediaeval cartographers of marking terra incognita with `Here be lions’ or `Here be dragons‘. I hasten to add that no lions were harmed during the talk. Anyway, it was nice to have an excuse to visit Brighton again. The last time I was here was over a year ago. It was nice to see some familiar faces, especially in the inestimable Miss Lemon, with whom I enjoyed a very nice curry after the talk! Now for a sleep and the long journey back to Cardiff tomorrow morning! One of the many interesting scientific results to emerge from last week’s announcement of a gravitational wave source (GW170817) with an electromagnetic counterpart (GRB 170817A) is the fact that it provides constraints on departures from Einstein’s General Theory of Relativity. In particular the (lack of a) time delay between the arrival of the gravitational and electromagnetic signals can be used to rule out models that predict that gravitational waves and electromagnetic waves travel with different speeds. The fractional time delay associated with this source is constrained to be less than 10-17 which actually rules out many of the proposed alternatives to general relativity. Modifications of Einstein’s gravity have been proposed for a number of reasons, including the desire to explain the dynamics of the expanding Universe without the need for Dark Energy or Dark Matter (or other exotica), but many of these are now effectively dead. The detection of an electromagnetic counterpart (GRB 170817A) to the gravitational wave signal (GW170817) from the merger of two neutron stars opens a completely new arena for testing theories of gravity. We show that this measurement allows us to place stringent constraints on general scalar-tensor and vector-tensor theories, while allowing us to place an independent bound on the graviton mass in bimetric theories of gravity. These constraints severely reduce the viable range of cosmological models that have been proposed as alternatives to general relativistic cosmology.